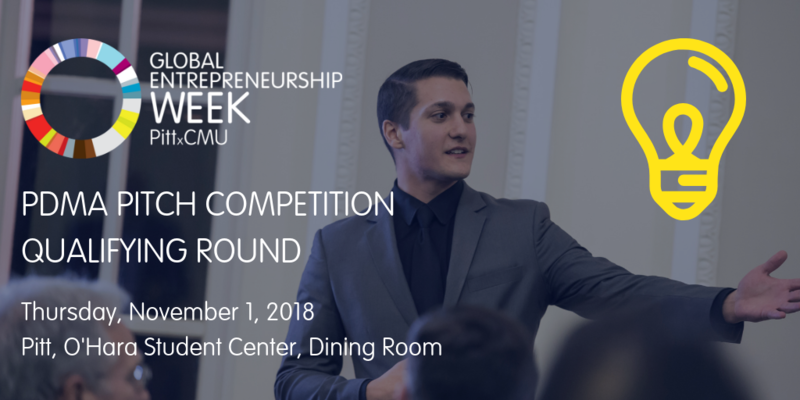 PDMA Pittsburgh will help celebrate Pitt and CMU’s Global Entrepreneurship Week by sponsoring yet another exciting student pitch competition. Eight top teams – four graduate and four undergraduate teams from Pitt and CMU – will have just 90 seconds to pitch their innovative ideas to an expert panel of judges to compete for great prizes. The winning teams will receive cash prizes as well as access to a variety of resources which are generously donated from local sponsoring companies. From mentoring on intellectual property to providing product development and manufacturing advice, the sponsors will be focused on helping these young entrepreneurs develop their products and services. *If you wish to compete in the competition and you are a PITT student please register for the qualifying round here. The qualifying round for the PDMA Pitch Competition will occur on November 1.